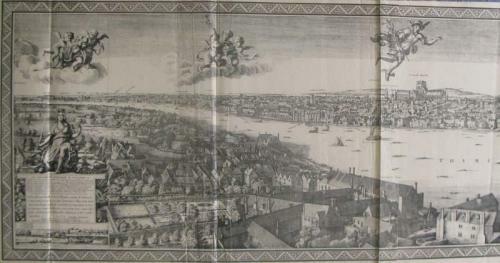 Title: 'Panoramic view of Old London A.D. 1647'. An 1879 photo-lithographic reproduction of Wenceslaus Hollar's Panoramic View of London AD 1647, also called the Long View of London. Consists of a 16-page introduction by Browne, and the foldout lithograph, which opens up to 231 cm (about 7 feet 6 inches) in length, by 52 cm (about 1 foot 8 inches tall). The introduction was printed by Walker & May, Mackillop Street, Melbourne. The lithograph is by Hamel & Ferguson, Queen Street, Melbourne. The binding is by Corbett Practical Book Binder, Castlereach Street, Sydney. A very scarce item. Gracius J. Browne is also known as Gracius J. Broinowski, whose works include Birds Of Australia. In very good condition: the panorama is mounted on linen and folded into decorative gilt boards.